If your garment says dry cleaning only, please follow those instructions. Use a small amount of wool detergent always NOT clothes detergent. 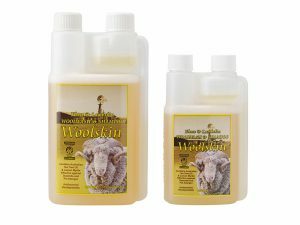 Woolskin (see image below) is excellent for washing knitwear. Wash & rinse in cool water temperature. Dry flat on a clothes horse or similar. Iron inside out using a hankie over the garment. Our sheepskins can only be washed with Woolskin sheepskin wash which is available at The Sheeps Back! Vaccum/shake the skin to remove dust, dirt, sand etc. Place in machine, turn OFF the hot water tap. On completion, re spin the skin to rid excess water,shake out, dry flat in the shade on a clothes horse, away from direct heat.ie not in front of heat pumps, fires or sunshine.